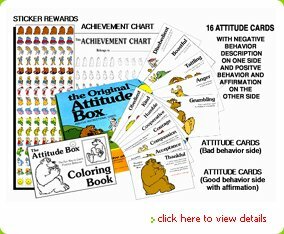 Attitude Box Helps To Improve Children Behavior Even Up To 4th And 5th Grade Students. How do you take control of your home’s environment without losing control of yourself? Simple. worse (further reducing self-esteem). It is only a temporary fix, as a child with low self-esteem will only act out more often. Third, you can allow the children to bring themselves into accountability. Now you are doing the right thing. Best of all, you’re not punishing the children for negative behavior, you are rewarding the children for proper responses. You are also reinforcing their choice of correct behavior and that builds relationships. The training of the correct behavior is reinforced. Self-esteem is enhanced by the child affirming themselves as a person who chooses correct behavior. No more crying or yelling and no more stress. Just one more sticker on the achievement chart.